Despite the large amount of similarity between the four groups of plesiadapiforms considered here, each is also unique in its own way. In some cases, morphological differences are probably engendered by size extremes that change the nature of the arboreal milieu experienced by a given taxon. In other cases, these features truly represent specialized behaviors beyond clinging and claw climbing on large diameter vertical supports and the ability to grasp smaller supports with the hands and feet. New skeletons of Late Paleocene paromomyids Acidomomys hebeticus (Bloch et al., 2002a) and a new species of Ignatius (Bloch et al., in review) are the most complete known and have clear dental-postcranial associations, allowing for a more refined and better supported understanding of postcranial anatomy and inferred positional behaviors for the group. Elements of the hands and feet have been recovered for Acidomomys (Figure 3A), and nearly the whole skeleton has been recovered for Ignatius (albeit a composite of two individuals; Figure 3B). Both paromomyids conform to the general plesiadapiform body plan (described in section on Plesiadapiforms as Claw-Climbing Arborealists above) in most respects. 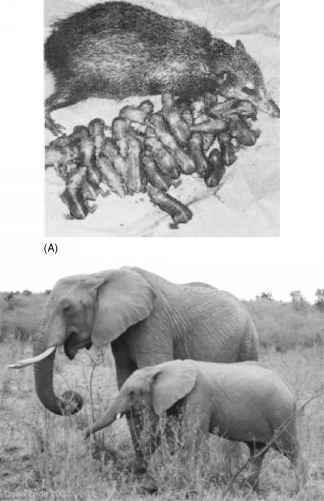 Of all plesiadapiform families considered here, paromomyids are most appropriately described as "callitrichine-like" because of their similar body size of 100-500 g (Fleagle, 1999; Garber, 1992), inferred diet of exudates (Gingerich, 1974; Vinyard et al., 2003) and specific locomotor repertoire that likely included bound-galloping, as well as grasping and foraging on small diameter supports in addition to a large amount of clinging and foraging on large diameter supports. This interpretation is contrary to a previous hypothesis that paromomyids were capable of dermopteran-like mitten-gliding (Beard, 1989, 1991a, 1993b) based on fragmentary, composite specimens with undocumented associations that were proposed to have the hallmark osteological feature of mitten-gliding: elongate intermediate phalanges of the hand. The mitten gliding hypothesis has since been questioned (Hamrick et al., 1999; Krause, 1991; Runestad and Ruff, 1995). Furthermore, the new specimens discussed here do not support the mitten-gliding hypothesis because the intermediate phalanges of the hands in paromomyids are not longer than their proximal phalanges (Figure 4A). Even in the face of such evidence against "mitten-gliding," one might argue that it is still possible that more general gliding behaviors (e.g., Petauristinae; Thorington and Heaney, 1981) could have been an aspect of the locomotor repertoire of paromomyids. Similar gliding behaviors, with correspondingly similar specialized anatomical structures (but not homologous), have evolved at least four times in mammals (Petauristinae, Anomaluridae, Phalangeridae, Cynocephalidae). Each of these experiments in gliding is also associated with unique aspects of anatomy reflecting very specific differences in behavior and evolutionary history (Essner and Scheibe, 2000; Scheibe and Essner, 2000; Thorington et al., 2005; Thorington and Heaney, 1981). While such differences can be subtle, this is distinctly not the case for dermopterans, which have unique anatomy among gliding animals reflective of the presence of an interdigital patagium and quadrupedal suspensory behaviors (Simmons, 1995; Simmons and Quinn, 1994; Stafford, 1999). Thus, even if evidence for more generalized gliding behaviors were to be found, it would still be inconsistent with Beard's (1993a,b) hypothesis that paromomyids were mitten-gliding. In fact, paromomyids lack any trace of the osteological correlates for gliding behavior. Figure 4. (A) Manual digit rays (top) and metacarpals (bottom) of paromomyid, Ignacius cf. I. graybullianus, the dermopteran, Cynocephalus volans, and a callitrichine primate, Cebuella pygmaea. Phalanges are in lateral view with distal and intermediate phalanges articulated on the left and proximal phalanx on the right. Below phalanges, from left to right, metacarpals V-III are depicted in palmar view. Note that Ignacius lacks the elongate intermediate phalanges and metacarpals of Cynocephalus and instead has overall proportions comparable to those of Cebuella. In this way, Ignacius is similar to euprimates that use their relatively long fingers for grasping (prehensile phalangeal proportions of Hamrick, 2001). (B) Reconstruction of Ignacius cf. I. graybullianus in a habitual resting or foraging posture on a large diameter trunk. The proportions and morphology of both limbs and vertebrae indicate that it was probably more adept at pronograde bounding than some other plesiadapiforms. Gray areas depict bones present in UM 108210 and another individual (UM 82606) from a different region within the same limestone block. Scale = 5 cm. Comparative functional studies show that there is a suite of osteological features shared by flying squirrels and dermopterans that appear to be gliding adaptations (e.g., Thorington and Heaney, 1981; Runestad and Ruff, 1995; Stafford, 1999), which are apparently lacking in Paleocene paromomyids (Boyer et al., 2001; Boyer and Bloch, 2002b; Bloch et al., in review). Instead, features uniquely exhibited by paromomyids indicate agile arboreality that involved more frequent use of pronograde bounding and scampering than inferred for plesiadapiforms generally. These tendencies are reflected in the limb proportions, the limb to trunk proportions, and the morphology of the vertebral column, sacrum, and innominate. Ignacius has an intermembral index of ~80, which is comparable to that of most callitrichine primates except the pygmy marmoset, Cebuella, in which it is 82-84 (Fleagle, 1999). Other plesiadapiforms have intermembral indices ranging between ~84 for Carpolestes and 89 for Plesiadapis cookei. Among clawed agile arborealists, including taxa classified in Rodentia, Scandentia (Sargis, 2002a), and Callitrichinae (Fleagle, 1999), higher intermembral indices may correspond to more frequent and sustained use of vertical clinging postures since the arms take a more active role in supporting and lifting the body, instead of acting as struts that must withstand impacts after propulsion by the hindlimbs, as they do in pronograde bounders (Gambaryan, 1974). Just as relative lengths of hindlimbs and forelimbs are behaviorally indicative, so is overall length of the limbs, relative to the trunk, which increases with frequency of use of vertical clinging postures (Boyer and Bloch, in review). 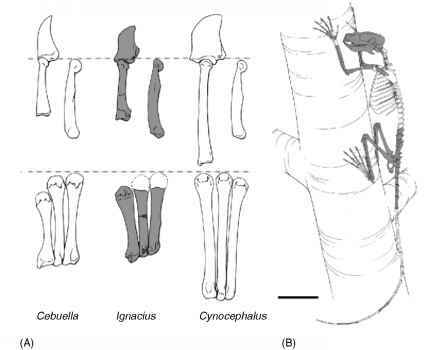 Although trunk length estimates are not yet available for micro-momyids or plesiadapids, comparison of the limb to trunk proportions of Ignacius with callitrichines shows Ignacius to be similar to tamarins, such as Saguinus, which have substantially shorter limbs than the more arboreally committed Cebuella. Vertebral morphology and proportions in Ignacius suggest agility and an emphasis on the hindlimb in forward propulsion. It is comparable to other squirrel-like and primate-like taxa in having a narrow atlas and a short neck relative to the trunk. The posterior lumbar vertebrae are larger and more elongate than the thoracic vertebrae. The sacrum is robust and the tail is long and robust. Such a configuration results in a posteriorly shifted center of gravity (COG) of the vertebral column relative to that of a non-bounder (Shapiro and Simons, 2002) or a quadrupedal runner (Emerson, 1985), thereby reducing the offset between the COG and the pelvic girdle, where the main propulsive force is applied by the hindlimbs. The morphology of the lumbar vertebrae also indicates the ability to powerfully flex and extend the trunk. These vertebrae have narrow, cranially angled spinous processes and long cranioventrally oriented transverse processes. They are qualitatively similar to those of scansorialists that use a bounding gait and strepsirrhines that leap (Shapiro and Simons, 2002). Furthermore, in bounding taxa, the relationships of the dimensions of these aspects of vertebral morphology to overall body mass are significantly different from those of non-bounders (Boyer and Bloch, 2002b; in review), with bounding taxa having lumbar spinous processes that are narrower craniocaudally and transverse processes that extend farther ven-trally than those of non-bounders. Ignacius fits the scaling relationship characterizing extant bounders. The sacrum of paromomyids has a reduced spinous process on its first vertebra and tall, narrow, caudally oriented ones on the second and third vertebrae. Such a configuration is similar to that of hindlimb-propelled taxa in which a large degree of flexibility at the lumbosacral joint is required. Not only does the spinous process of the first sacral vertebra not impede extension, but the supraspinous ligament, which might have spanned two vertebrae instead of one (Gambaryan, 1974), would have allowed a greater range of mobility for the same elastic strain than it would separated into two segments. The innominate of paromomyids differs from that of other plesiadapiforms in having an ilium with a relatively broader dorsolateral surface, an ischium that is relatively longer and more expanded, and an ischiopubic symphysis that is longer and more cranially positioned (relative to the acetabulum). These features indicate a sturdy pelvic girdle with ample room for origination of the hip extensor muscles. Such a pelvis would be capable of withstanding impacts of a bounding gait and would allow room for the attachment of powerful muscles adequate for the effective use of such an active locomotor style. In summary, the skeleton of Ignacius indicates a versatile locomotor repertoire with no specific features detracting from its ability to use vertical postures (Figure 4B), but with additional features that allowed it to effectively exploit horizontal substrates using above branch postures.